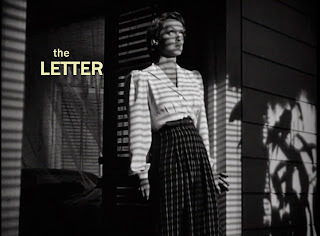 This week's pick for Hit me with your best shot is the classic film noir "The Letter". Directed by William Wyler and starring the great Bette Davis, it bears many of the traits of the genre - devious woman, murder and crime-solving. It thus makes for compelling viewing, albeit slightly facile and a tad overdramatic in parts. 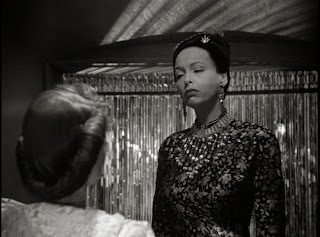 The main draw however, is the star quality of Bette Davis, who gives good face as the femme fatale. For the purposes of this best shot challenge though, I decided to highlight another actress who also does strong work in the film. 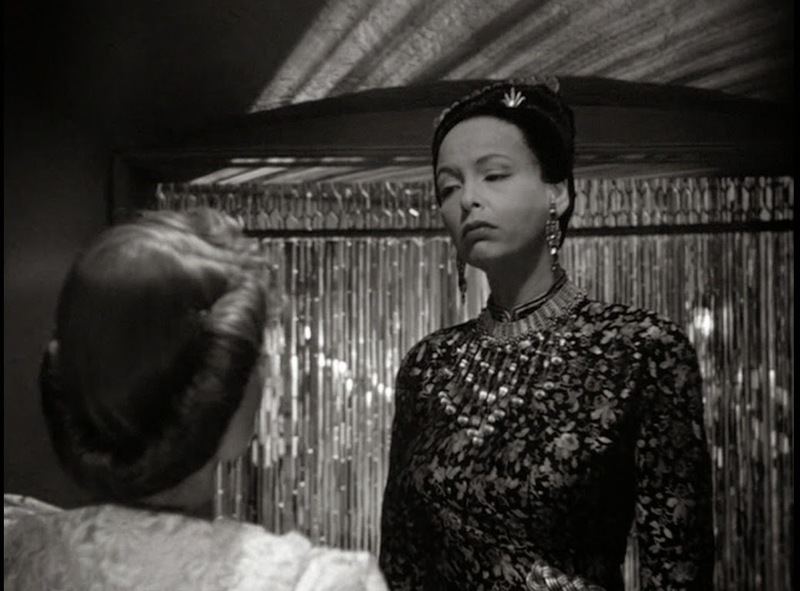 In this scene, Leslie (Bette Davis) goes to meet the widow of the man she murdered, Mrs. Hammond (Gale Sondergaard). They arrange to make a deal, exchanging money to keep the truth of the titular letter under wraps (it rebukes Leslie's self-defense claim, acknowledging an affair). Like the diva she is, Mrs. Hammond makes Leslie wait before making her grand entrance. It's clear that Leslie has met her match. Hammond stands her ground and demands that she come closer. As she steps forth, I love how Davis is dwarfed by Sondergaard in the shot. It's almost like a standoff in a Western, except the women aren't on equal footing. Sondergaard's character clearly has the upper hand. Furthermore, the sparkly backdrop and her sophisticated attire make her seem almost regal, whereas David looks more plain Jane. They're both silent but you can easily imagine Sondergaad's internal monologue just from her face and body language (she even drops the letter to force Davis to kneel at her feet!). She's probably saying something like "You won't know when and you won't know how, but I'm coming for you. B***h." Of course, if you've watched the film, you know how that turns out. 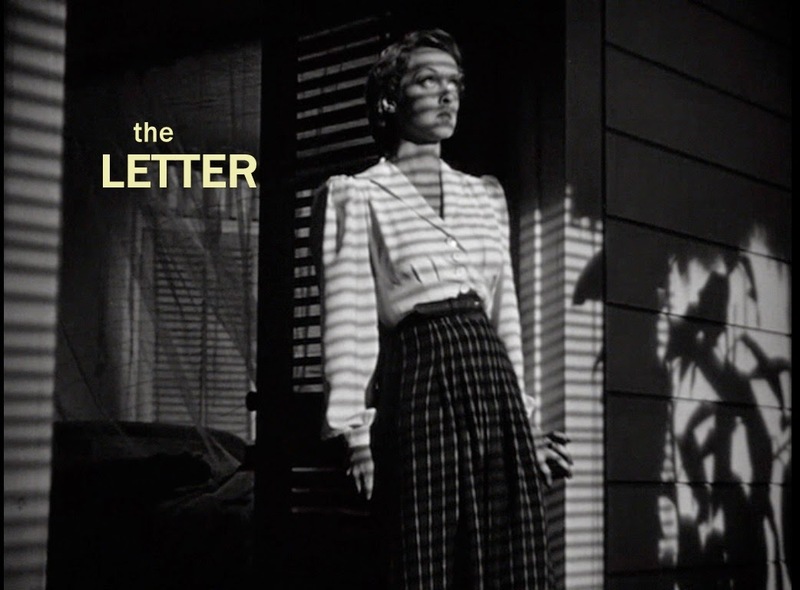 The film noir genre often focuses on a singular femme fatale, but "The Letter" shows that there's indeed room for these two fierce ladies. Kudos to the writers and director for giving us this unique take. The film is all the better for it.